In Fall 2018, Makerspace internship program offered two workshops to interns to learn more about 21st Century skills or New Word or Work (NWoW). The workshop covered self awareness, adaptability, analysis/solution mindset, resilience, communication, collaboration, entrepreneurial mindset and Empathy. The workshop started with a three page self awareness handout followed by a speed dating style share out to work on networking. The interns then had to create a cause and effect kinetic sculpture. Which later they had to collaborate combining each of their creations into one kinetic sculpture through group activity. On November 29th, Cabrillo Makerspace interns visited the headquarters of Plantronics, a leading producer of commercial and personal headsets. The purpose of the visit was to expose Cabrillo interns to a real world work environment. It also gave the students a rare chance to speak to the engineers, industrial designers and marketing managers about their jobs and the various skills needed to work there. Following a tasty lunch, Cabrillo students spoke to several Plantronic employees who began their employment out as interns. Kudso to Courtney Cogan of Goodwill Central Coast who arranged for the Plantronics visit. Courtney serves as a liaison between Cabrillo ‘s Makerspace Intern program and local businesses. For Fall 2018 semester, students in the digital fabrication classes, 95A, 95B, 196A, 196B had the unique and rare opportunity to cast their 3d printed PLA models in bronze for their final project. Taught by Payson McNett, department head for Sculpture and Digital Fabrication, the goal of this assignment is to encourage digital fluency and hand on experience. The 95A class was instructed to create a bell and classes 95B, 196A and 196B were instructed to create an ancient relic. The extraordinary aspect of the assignment was the range of skills needed to complete the assignments – from digital fabrication to the hands on finishing of a bronze cast. On the digital side, students used 3d modeling tools e.g. Rhino, Blender and Tinkercad to design their projects, then printed the models using the Ultimaker 3d printers. On the bronze side, Payson guided his students through the casting preparation and the pour. Briefly those steps include gating the PLA models, creating the flasks, immersing the PLA models in a special plaster(investment) and burning out the PLA. Finally, the bronze alloy was melted in a large crucible and poured into the hots flasks. The result - over 200 pounds of bronze was poured between the 9 flasks and over 80 bronze objects were successfully cast. Payson setting up the furnace. This Fall, John Graulty, Dean of Visual, Applied, and Performing Arts spoke at NACCE (National Association Community Colleges Entrepreneurship). The focus of the meeting was how to involve local businesses with Makerspaces. Today, the growing use of digital fabrication, rapid prototyping, and advanced manufacturing processes in industry has created a new demand for workers with a blend of STEM-based digital design skills. To help meet the demand of a new work force, the California Economic Summit created the Partnerships for Industry and Education (PIE) initiative to promote efforts by employers and educators to work together to meet regional and state workforce needs. Cabrillo Makerspace in partnership with Goodwill Central Coast has been addressing this demand. Internships are offered to students - giving them the opportunity to apply their newly acquired STEM-based digital skills. 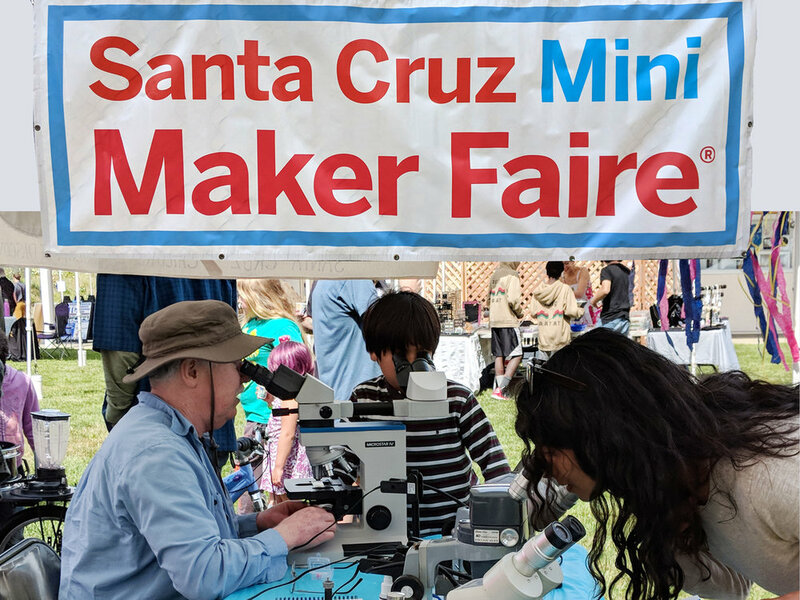 This collaboration between Cabrillo Makerspace and Goodwill Central Coast was recently highlighted in the PIE contest. Kudos goto Courtney Cogan, Anne Guthrie, Richard Cheathamm and Mary Govaars who have worked hard matching the best students candidates for the job. On October 18th, the County Arts Educators Exchange and Cabrillo sponsored a K-12 Arts Workshop. Led by Payson McNett, participants created Halloween masks using 3d prints and a vacuum forming machine. The master mask was printed using the Ultimaker 3d printer then blanks were created using the vacuum forming machine. Finally, the participants hand decorated each blank mask. Here is the standing desk I made using the shopbot for Ricardo Espinoza in Supplemental Education. The desk is a success (thanks Chris for your invaluable help!). The desk is very sturdy and went together without the need for glue or fasteners. Total cost was just under $200. Ricardo says that he is much happier in his office and that he feels better physically at the end of the day (he really does not like sitting). Ricardo is also a veteran and has been discussing redoing the reception desk in the Veteran center with Flor Chacon - again the new desk would be made by the Makerspace. I am really excited to see the integration of the Makerspace into the rest of campus and would love to know if there are any ideas or suggestions to help keep the ball rolling with these kinds of projects. How do we brag/publicize these things? In what other ways can we be serving the campus community? Is this sort of project still beneficial to the Makerspace?